How the story of a statistics student being late to class became the inspiration for the protagonist of Good Will Hunting. One of the iconic scenes from Good Will Hunting shows Matt Damon's character anonymously solving a nigh-impossible math problem on a blackboard at the university where he works as a janitor. This story, while modified for the purposes of the film, actually happened. George Dantzig, who would later become a famous mathematician, was late to his graduate statistics class one day when he saw two statistical problems on a blackboard that he mistook for homework. 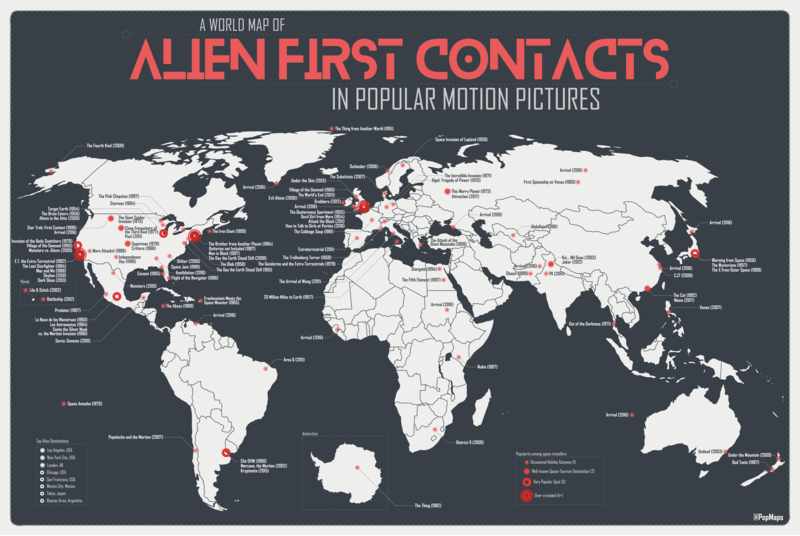 First contact movies had their Golden Age in 1980s America – now they're going global. Credit: Dylan_Mq. Find his maps on Reddit, Twitter and Etsy. The first extra-terrestrial to make contact (in a movie) appeared in 1920s Germany. 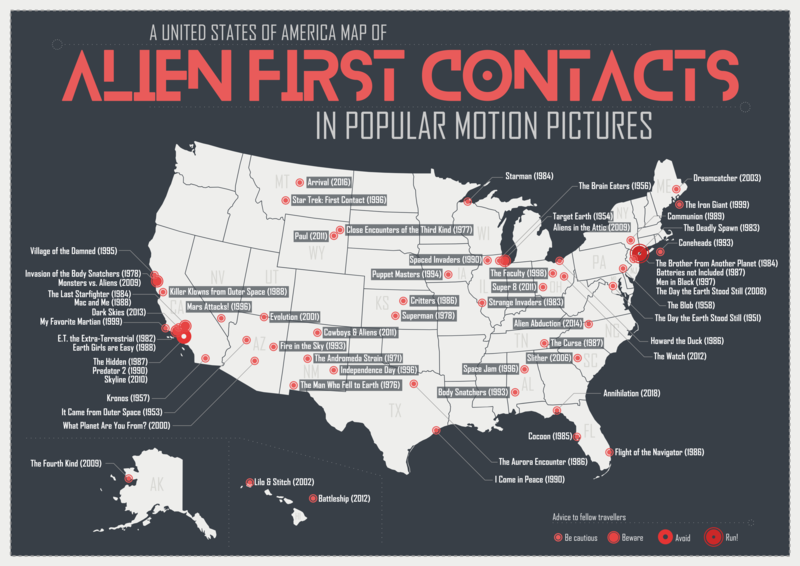 ET set off a wave of 'first contact' movies in the 1980s. Many recent alien-landing movies are set in China and India – the future of the genre may well be Asian. What's the role of evil in storytelling? Towards the end of the Disney film Aladdin (1992), our hero's love rival, the evil Jafar, discovers Aladdin's secret identity and steals his magic lamp. Jafar's wish to become the world's most powerful sorcerer is soon granted, and he then uses his powers to banish Aladdin to the ends of the Earth. Is James Bond an alcoholic? A scientific study of the legendary drinker. A new study analyzes the possibility that Bond has a problem. The lethal super spy generally rocks a killer blood-alcohol level. What's actually so cool about this guy? China's rise has necessitated a global PR push. It includes influencing how the movies you watch depict China. China will soon overtake the U.S. as the world's largest market for films, and it is using that fact to influence how it is depicted by Hollywood. While Chinese investors have been interested in buying shares of studios for a while, the real power lies in deciding which movies get into China at all. The influence is often subtle, but may have already derailed a few careers in the name of politics. Wait, what? How do they do that? Jason Statham and Li Bingbing lead the cast of The MEG. <p>Supply and demand combined with strict controls on what movies get into China. At the time of writing, only 34 major American films are allowed into China each year using a quota system. Since China is the world's largest film market, <a href="https://www.youtube.com/watch?v=8R-FQTY4KJk" target="_blank">getting into it is a very competitive business</a>. Movies that the censors don't like aren't going to get in, giving them tremendous power over what money-chasing Hollywood executives are going to make.</p><p> You can circumvent the quota system by co-producing the film with a Chinese firm, which makes it a domestic film for quota purposes. This method has lots of strings attached though, as it requires a movie to have a certain number of Chinese actors, filming locations in China itself, and the film cannot portray China as a villain. </p> Some of the co-produced films it makes are big-ticket items. In 2018, the list included <em><a href="https://www.imdb.com/title/tt4912910/" target="_blank">Mission: Impossible — Fallout,</a> <a href="https://www.imdb.com/title/tt1270797/?ref_=nv_sr_1" target="_blank">Venom</a>, </em><em><a href="http://usa.chinadaily.com.cn/a/201808/13/WS5b70c91ba310add14f3854dd.html">The MEG</a></em>, and <em><a href="https://www.imdb.com/title/tt2557478/?ref_=fn_al_tt_1" target="_blank">Pacific Rim: Uprising</a>. </em>Other blockbuster films from the last decade to be co-produced include <em><a href="https://www.imdb.com/title/tt0451279/?ref_=nv_sr_1" target="_blank">Wonder Woman</a>, <a href="https://www.imdb.com/title/tt2267968/?ref_=fn_al_tt_1" target="_blank">Kung Fu Panda 3</a>, </em>and <em><a href="https://www.imdb.com/title/tt1276104/?ref_=fn_al_tt_1" target="_blank">Looper</a></em>. Call Joe McCarthy; the commies are influencing Hollywood! The red menace is back, and it's using supply and demand this time! The irony is overwhelming!